Although the phrase “you get what you pay for” may be a bit of a cliché, it certainly rings true in regards to your bathroom shower door hardware. Many homeowners do not realize this fact, which is why we are writing about it today. Although the less expensive knock off products may be stylish, and look great when first installed they tend to wear out quickly. In some cases the inferior materials actually cause expensive damage. Here is an example of what can happen when your builder or home improvement contractor installs shower door hardware that is simply not up to par. We received a call recently, and the customer explained that he needed us to replace all of his shower door hardware. 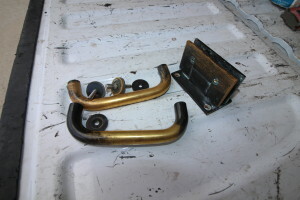 Apparently both of the hinges had failed. They were loose and popping causing him to rightfully worry that the glass door would fall of and break. In addition, the finish on his bathroom hardware had worn off. Our company was more than happy to help. We ordered the new hardware, and schedule an appointment to install it. When our field technician arrived at the house, he was able to see that the builder had installed a frameless glass shower door on cultured marble, and failed to secure it properly. The hardware, including the failed hinges was of extremely poor quality and could not stand up to the moisture created by the shower. We replaced all of the hardware with brand new CR Laurence hardware, replaced the door seals, and properly cleaned the door. The lesson to be learned here is that you need to make sure that your contractor is installing quality hardware in your new shower, and not that inexpensive Chinese knocks. Please contact A Cut Above Glass for any of your glass related needs in Scottsdale, Arizona and surrounding areas.